When it comes to building an electric motorcycle, there are components you immediately know you’re going to need, but also a lot of systems of which you didn’t have the slightest idea why it would ever be needed on an electric racing bike. Obviously a pair of wheels might come in handy for a motorcycle, and some kind of electrical energy storage on the bike eliminates the need for a very long cable to power all the onboard systems. However stuff like a safety control circuit to ensure a smooth cooperation between the subsystems, and a BMS for monitoring and protecting the battery pack might not immediately come to mind. That having said, there is one component you know for sure you’re going to need. Something to convert the available electrical energy to actual movement. Correct, I am talking about an electric motor. 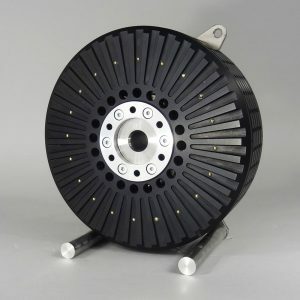 The motor that NovaBike is using is an EMRAX 268 axial flux synchronous motor, which is shown in the picture below on the left. This is an AC motor being supplied with three-phase, sinusoidal voltages. The stator is the shiny metal part in the middle of the motor, and is connected to the frame. The rotor is the outer, black part and this is the part that actually rotates during operation. This motor is controlled using a BAMOCAR D3 digital three-phase servo amplifier, which is shown in the picture on the right. This motor controller can be supplied with DC power from the batteries, and will output three voltages, each 120 degrees out of phase with each other. These three phases control three groups of windings, which are placed at different angles (120 degrees apart) in the stator, giving rise to a rotating magnetic field. The rotor in this specific motor contains permanent magnets, creating a magnetic field in the rotor with a fixed north- and southpole. This magnetic field will try to align its field with the rotating magnetic field in the stator, thus creating a torque which rotates the motor in the same direction as the rotation of the stator field. In steady state the rotational speed will be the same as the speed of the rotating magnetic field, which in turn depends on the frequency of the three-phase voltages. A special feature that we are currently working on is regenerative braking. In general, a synchronous machine can work both as a motor and as a generator. If three-phase voltage is applied the motor will output mechanical energy in the form of rotation, as explained above. If no electrical power is supplied however, mechanically rotating the rotor will induce three-phase voltages, and the machine is working as a generator. Of course in the practical case both processes occur at the same time. While using the machine as a motor there will be a load torque present, which is trying to slow the motor down. Vice versa, if the machine is used as a generator, there will be a load current flowing which will also generate a torque that slows the motor down. In a normal braking operation the supply current is removed from the motor, and a mechanical brake applies a torque in the direction opposite to the rotation of the motor to slow it down quickly. Removing the supply current will prevent the motor from accelerating, but because there is no current flowing anymore, there is hardly any torque slowing the motor down. That’s why the additional torque from the mechanical brake is needed to bring it to a quick stop. Instead of only removing the supply current during braking, a load can be attached to the electrical input of the synchronous machine. Because the motor is still rotating, it will work as a generator and a current flows into the load. This current will generate a torque that is slowing the motor down and therefore acts as a brake. By varying the current that flows into the load, it’s possible to control how hard the motor brakes. If this load is a device that can store electrical energy, for example a capacitor bank, then the current used to slow the motor down can later be used to accelerate it again. This is a great feature for a racing motor since it can make the difference between finishing the race or having to stop early because of a depleted battery pack. The electric motorcycle that is being built this year will have a regenerative braking option, but the system is very limited. This is because the idea only came up when the design was finished and the building had already begun. Designing an elaborate system would take a lot of time, and more space in the motorcycle would be needed. The current system can regenerate a bit during braking, because the battery pack can also act as a load. However, it is not possible to brake fast while regenerative braking is allowed, because the voltage gets higher when the braking is more abrupt and battery cells don’t like to be charged above their maximum rated voltage. Furthermore the cells also have a maximum charging current which may not be surpassed, so the braking torque is limited. Still, the first steps are taken towards regenerative braking in electric motorcycles, and we keep searching for solutions to improve our regenerative capacity. Now I’ve got to go, because supper is ready and I have to regenerate my own energy storage.